It’s been a franchise defining nine games for the Belleville Senators who return home this week on a nine-game point streak. The Senators, who have gone 6-0-0-3 over the streak, sit just five points behind Utica and Toronto in the North Division playoff race. Its also put the Senators over the .500 mark for the first time with the team currently sitting on a 24-23-2-3 record. “It’s just consistency from us,” Sens captain Erik Burgdoerfer said. “Obviously, our first line is really clicking, as has our power play, but up and down the line-up we’ve been clicking and haven’t been giving up a ton against and our goaltenders have been playing well. 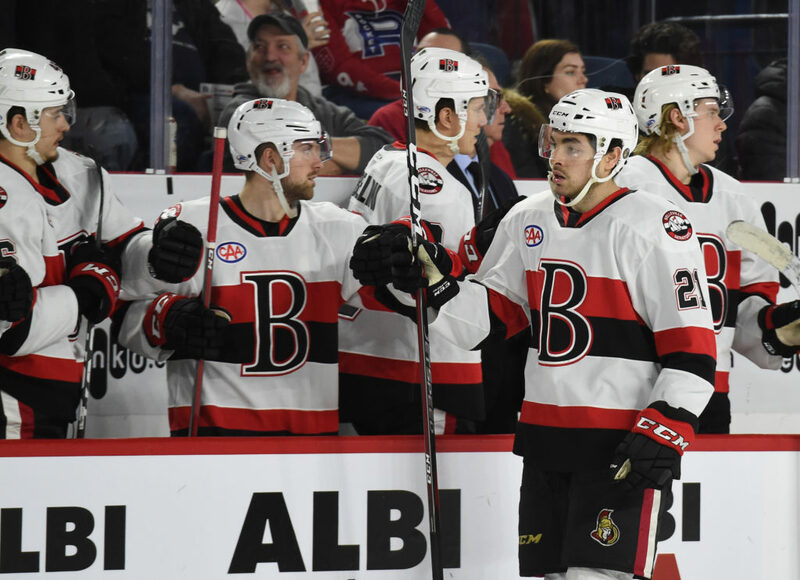 Part of the Sens’ spark over the past nine games has been the play of the team’s first line of Drake Batherson, Logan Brown and Nick Paul who have combined for 28 points over their last four games, all of which were wins. Batherson is currently riding a nine-game point streak while Brown has points in his last eight. With 24 games left in the regular season, the Senators still have to make a push. But one thing’s for certain, they’ve put themselves in a position to make the playoffs for the first time in franchise history. “We’ve said all along we need to go on a bit of a heater,” Brown said. “We were a few points back and we’ve closed the gap the last couple of weeks.